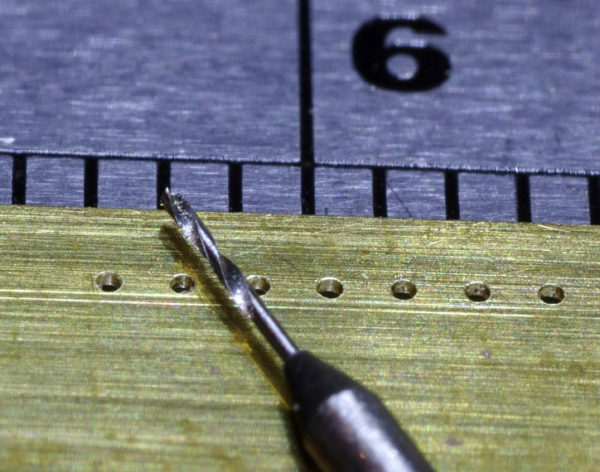 Robust bits for tiny holes. One of the not infrequent modelling tasks we all encounter is the making of tiny holes. Very small jobber drills are reasonably easy to get, but a devil to hold, easy to break and not cheap. ‘Micro drills’ with a 1-1.2mm shank are a better tool for modeller’s needs as they are easier to use and generally last longer in our experience. They are high quality and easy to hold. High speed steel (HSS) is the material of choice, particularly for alloys like brass. 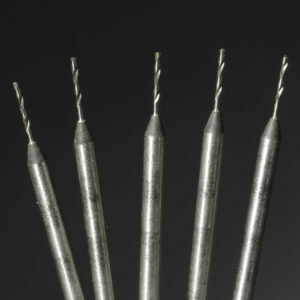 Carbide bits are widely available off the Internet but these are very brittle in modelling applications. HSS micro drills don’t come cheap though and are usually $20 each from local suppliers. Fortunately we’ve been able to source some rather nice substitutes at considerably less. These are of Russian manufacture and are very good quality for modelling applications. We have been using them in the drill press or by hand in a pin chuck with great success (a little lubrication helps a lot). Packaged in threes as you always need a spare or two.